The Angkor complex which is composed of temples such as Angkor Wat, Angkor Thom, Ta Keo and Ta Prohm, and West Barai is a religious structure and a hydrological system constructed from the 9th to 13th centuries of the Khmer period. Therefore, for more than 800 years, it has experienced significant natural and human-driven deteriorations. In terms of natural deterioration, sandstone and laterite building materials rapidly deteriorate under tropical climates. Although chemical weathering is a major process in the tropics, as well as biochemical weathering (e.g., Liu et al. 2018), other forms of mechanical rock weathering such as wet-dry weathering (e.g., Waragai 2002, 2005a; Siedel et al. 2010; André et al. 2011), salt weathering (e.g., Uchida et al. 1999; Hosono et al. 2006; André et al. 2008; Siedel et al. 2008, 2010), and root wedging processes (Archaeological survey of India 2006) are also significant. For instance, Waragai (2002, 2005a) suggested that, at the Angkor Wat temple, deterioration occurs because the sandstone blocks contain clay minerals, which are constantly exposed to severe cycles of wet-dry weathering. On the other hand, Uchida et al. (1999) reported salt efflorescence of minerals such as gypsum, calcite, and phosphate on the sandstone pillars of the Angkor Wat temple. These weathering processes are thought to be restricted by direction dependent (Waragai 2005b; Waragai et al. 2006; André et al. 2012; Hiki 2012; Hiki and Waragai 2014; Waragai 2016), especially for the temples at Angkor. Regarding cultural stone weathering, previous studies have shown the importance of direction or aspect related to heating-cooling repetitions and moisture changes (Meierding 1993; Paradise 1995, 2002; Williams and Robinson 2000; Waragai 2017). Recently, a relationship between the weathering of sandstone pillars and the pillar water content in conjunction with the microclimatic conditions has been pointed out (Hiki and Waragai 2014). However, in their study, the microclimatic conditions of the air temperature and humidity were only measured for 1 year or less. Therefore, to obtain a representative view of the microclimatic conditions, longitudinal monitoring of the weathering environment must be performed. It is also necessary to understand the distribution and volume of the weathering within the temple. Accordingly, we discuss both the long-term monitoring of the weathering environment and the directional dependence of the weathering process based on the depths of the hollows (i.e., notches) in the sandstone pillars, which is regarded as a measure of the weathering volume. The Angkor Wat temple, located in the tropics (N 13.412, E 103.867), was built with a masonry style of construction using blocks of sandstone and laterite during the reign of the Khmer King Suryavarman II (1113–1150 CE). The temple is surrounded by a moat that is 1300 m from north to south and 1500 m from east to west, with a central sanctuary made from sandstone blocks 62 m in height (Fig. 1). Three rectangular galleries of varying heights were constructed around the central sanctuary (Fig. 2a). These are called the first gallery, the second gallery, and the third gallery from the outer to central parts of the temple, respectively. The first and third galleries, which were selected as the study area, are colonnades composed of square sandstone pillars (Fig. 3a, b). The first gallery is 200 m from north to south and 220 m from east to west and is the longest passageway with gopuras (Fig. 2a). The gallery has a height of 6 m with a vault that is 4 m above the ground (Fig. 2b). A closed wall supports the roof of the vault, and it is decorated with bas-reliefs as well as inner and outer pillars joined by beams (Fig. 3c, d). Several outer pillars are reinforced by mortar and/or iron hoops due to the development of vertical cracks and severe deterioration. Hollows are visible at the bases of the inner pillars (Fig. 3c, e). These hollows are continuing to grow via wet-dry weathering (e.g., Waragai 2005a; Hara and Waragai 2010; Siedel et al. 2010) and salt weathering (e.g., Uchida et al. 1999; Hosono et al. 2006; Siedel et al. 2008). The depths of the hollows are correlated to the directions faced by the pillars and the galleries. The third gallery, located approximately 30 m above the ground, forms a square shape with a length of 70 m from north to south, and 70 m from east to west (Fig. 2a). The gallery surrounds the courtyards around the central tower of the sanctuary, and an enclosure wall with window is located along the outermost side of the sanctuary. The third gallery (Figs. 2c, 3b), which is characterized by a ventilated environment, differs from the first gallery, because the inside of third gallery is open on one side. A combination of 196 inner and outer pillars and the enclosure wall support the roof of the gallery. The pillars, which are reinforced and/or are developing cracks, are minuscule. However, hollows have developed at the bases of the inner pillars (Fig. 3f), producing sandstone fragments. There is no evidence of hollow formation on the outer pillars at the first and third galleries. It is presumed that the differences in the shape of the pillar bases and the vertical loads are responsible for the formation of the hollows (Kambe et al. 2016). According to Waragai and Hara (2011), the sandstone block has a specific gravity of 2.64, a dry unit weight of 2.30 g/cm3, a saturated water content of 6%, a porosity of 13%, and a tensile strength (dry) of 9.4 MP. Meteorological observation at the Angkor Wat temple (the observation point is shown in Fig. 1; AMOS) between 2011 and 2016 shows an annual average temperature of 27 °C with a total annual rainfall of 1633 mm (Waragai 2018). The monthly average temperature is the highest (29.6 °C) in April and the lowest in January (24.9 °C), and the variation in the annual temperature is relatively small (Fig. 4). Conversely, the monthly rainfall from June to October is 243–358 mm/month and that from December to February is 0.1–16 mm/month. Therefore, there is a clear distinction between the rainy and dry seasons at the study area. The temple galleries are precisely oriented in the cardinal directions (Fig. 2a), and hollows occur in the bases of all the inner pillars of the galleries. In the first gallery, there are 64 inner pillars in the northern (1N) and southern (1S) galleries, and 38 inner pillars in the eastern (1E) and western (1W) galleries. In the third gallery, there are a total of 32 inner pillars with hollows: 8 in each of the eastern (3E), western (3W), northern (3N), and southern (3S) galleries. Because the courtyards are in the enclosure wall of the third gallery, the pillar arrangement is opposite that of the first gallery (Fig. 2b, c). We define the inner pillars of the third gallery as pillars that have hollows at their bases. To measure the hollow depth, we selected a total of 91 inner pillars from the first gallery and 16 inner pillars from the third gallery (Fig. 2a). Specifically, in the first gallery, we selected 28 pillars from the northern gallery (1N), 22 pillars from the western gallery (1W), 19 pillars from the eastern gallery (1E), and 22 pillars from the southern gallery (1S). The selected pillars are equivalent to approximately 45% of the total pillars in the first gallery. On the other hand, eight inner pillars were selected from each direction in the third gallery (3E, 3W, 3S, and 3N; 32 pillars in total). Although hollows form on all sides of the inner pillars, we only measured the hollow depth at both the outside and inside hollows of the pillars using a caliper during August of 2012. The depth is defined as the maximum depth between the original surface and the innermost point of the hollow. An Equotip 3 Hardness Tester (Proceq SA) was used to measure the hardness on the inside and outside of the pillars in August 2012. This device is often used in order to estimate in situ non-destructive hardness of stones (e.g., Aoki and Matsukura 2007; Wilhelm et al. 2016a, 2016b). Average hardness (the Leeb hardness; Kompatscher 2004) was calculated from five measurements on the innermost surfaces of the inside and outside hollows for all selected inner pillars in the first gallery. In the third gallery, the inside and outside hollows on two inner pillars in each direction were selected to measure the hardness. An infrared optical moisture meter (JT Engineering Inc., JE100) was used to measure the water content of the pillars. This meter measures the water content based on the amount of absorbance of reflected light converted from the amount of infrared light that bounces from an object (Matsukura and Takahashi 1999). For the gray sandstone at the Angkor Wat temple, water content is calculated based on the absorbance measured by the meter (Waragai et al. 2008). To measure the water content, eight pillars (1NW26, 1EN04, 1SE02, 1WS03; 3NW03, 3EN03, 3SE02, 3WS03) were selected from each cardinal direction in the galleries for each hollow on the inside and outside of the pillars (Fig. 2a). The hollow surfaces of the selected pillars were measured nine times in the first gallery (around 10:00, 15:50, August 10, 5:50, 7:00, August 11, and 10:20, 11:30, 15:30, 16:20, 17:30, August 12, 2012), and five times on pillars of the third gallery (around 10:00, 11:30, 15:00, 15:50, 16:40, August 14, 2012). To analyze the effects of the weathering environment due to the different directions of the galleries, the air temperature and relative humidity were simultaneously measured from August 22, 2011 to September 6, 2015. Measurements were obtained in 30- or 60-min intervals using eight data loggers (Onset Computer Co., H08-032-08 and T&D Co., CTD-RTR-52A). Data logger installation points are shown in Fig. 2a. Four data loggers were installed on the beam connecting the inner and outer pillars of each cardinal direction in the first gallery (Fig. 3d). Another set of four data loggers was installed on the back of a lintel at each corner of the third gallery. The results of the hollow depth measurements in the first gallery are shown in Table 1 and Fig. 5. Table 1 shows that the depth ranges from 4.0 to 95.4 mm (with an average of 34.1 mm) for the outside hollows, and 0–36.0 mm (with an average of 12.9 mm) for the inside hollows. The outside hollows were noticeably deeper than the inside hollows. Figure 5 shows the distribution of the hollow depth, grouped into classes at an interval of 10 mm depth. Many of the outside hollows exhibited more than 20 mm depth, except in the northern gallery. On the other hand, depths of less than 20 mm are dominant (90%) in the inside hollows. Depths are elevated in the outside hollows, but shallow in the inside hollows. We then compared the depths of the outside hollows to the gallery directions finding that 1E (with an average of 46.5 mm), followed by 1S (with an average of 34.8 mm), 1W (with an average of 33.6 mm), and 1N (with an average of 21.4 mm). In particular, the outside hollows with more than 50 mm depth occupy approximately 42% of the pillars in the eastern gallery (Fig. 5). Conversely, the outside hollows with less than 20 mm depth occupy approximately 57% of the pillars in the northern gallery. The depths of the inside hollows are as ranked as follows: 1W (with an average of 16.6 mm), 1E (with an average of 14.2 mm), 1S (with an average of 12.5 mm), and 1N (with an average of 8.4 mm). Therefore, the hollow depths in 1N were shallower than those in the galleries in other directions. The results of the hollow depths in the third gallery are shown in Table 1. The depths range from 21.1 to 134.1 mm (with an average of 53.9 mm) for the outside hollows and 12.7–84.8 mm (with an average of 46.8 mm) for the inside hollows. The average depth of the outside hollows is approximately 7 mm deeper than that of the inside hollows. A depth difference between the inside and outside hollows is observed for 3E and 3W in the third gallery; however, this difference is smaller than that observed in the first gallery (Fig. 5). As shown in Fig. 5, when the depths of the outside hollows are compared with the directions of the third gallery, it indicates that 3E and 3W are the largest (with an averages of 64.7 and 64.0 mm, respectively), followed by 3N (with an average of 49.5 mm) and 3S (with an average of 37.4 mm). The outside hollows are more than 60 mm deep for 63% of the hollows in 3E and for more than 50% of the hollows in 3W. On the other hand, the inside hollows have depths of 49.9 mm in 3S, 48.4 mm in 3E, 45.6 mm in 3W, and 43.4 mm in 3N. The depth range of the inside hollows is smaller than that of the outside hollows, with no influence of the gallery direction. The average hardness and standard deviations are shown in Fig. 6. The average hardness in the first gallery was 402 HLD in the outside hollows and 334 HLD in the inside hollows (Fig. 6). The hardness of the outside hollows was noticeably greater than the inside hollows. The maximum average hardness of the outside hollows, in decreasing order, is 1N (438 HLD), 1W (411), 1W (383), and 1E (376). The difference between the maximum and minimum hardness is 62 HLD. On the other hand, the range of hardness in the inside hollows is small, ranging from 349 HLD (1S) to 319 HLD (1W). Therefore, the hardness of the hollows was high in the outside hollows in 1N, and the difference due to the gallery direction was negligible for the inside hollows. The average hardness in the third gallery was 311 HLD for the outside hollows, and 323 HLD for the inside hollows. The hardness difference is small between both sides as well as gallery directions. The ranges from minimum to maximum hardness are from 289 HLD (3N) to 341 (3S) for the outside hollows, and from 307 (3W) to 333 (3S) for the inside hollows. Therefore, it indicates that the outside and inside hollows, as well as the gallery directions, have no influence on the hardness. The results of the water content measurement in the first gallery are shown in Fig. 7 accompanied with the maximum and minimum concentrations. The water contents in the first gallery were 2.0–4.5% (with an average of 3.0%) for the outside hollows, and 4.0–6.6% (with an average of 5.0%) for the inside hollows. Average water contents of the inside hollows were approximately 2% higher than those of the outside hollows. Comparing the water content for each direction in the gallery, the outside hollows of 1N was the highest contents (3.8%) on average, followed by those of 1S (3.2%), 1E (2.7%), and 1W (2.4%). The water content of the inside hollows was the highest for 1E (5.2%), while the lowest for 1S (4.7%); however, the differences between the directions were small. The water contents were high for both the inside and outside hollows of 1N. The results for the water content in the third gallery are shown in Fig. 7. The water contents ranged from 2.8 to 5.1% (with an average of 3.6%) for the outside hollows and from 2.7 to 4.5% (with an average of 3.7%) for the inside hollows, with only a small difference between the two. 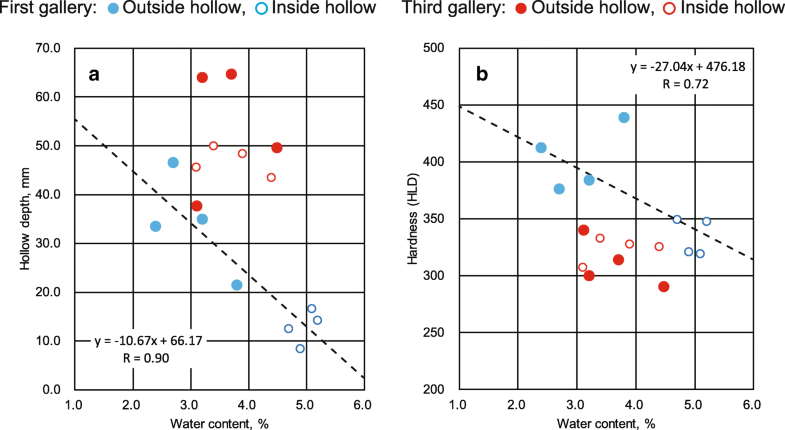 Comparing the water contents for each direction of the gallery, the outside hollows of 3N was the highest (4.5%) on average and those of 3S (3.1%) was the lowest. The water contents of the inside hollows were also the highest for 3N (4.4%) and the lowest for 3W (3.1%). The water contents tended to be high at the northern end of the third gallery despite the direction having relatively little influence. 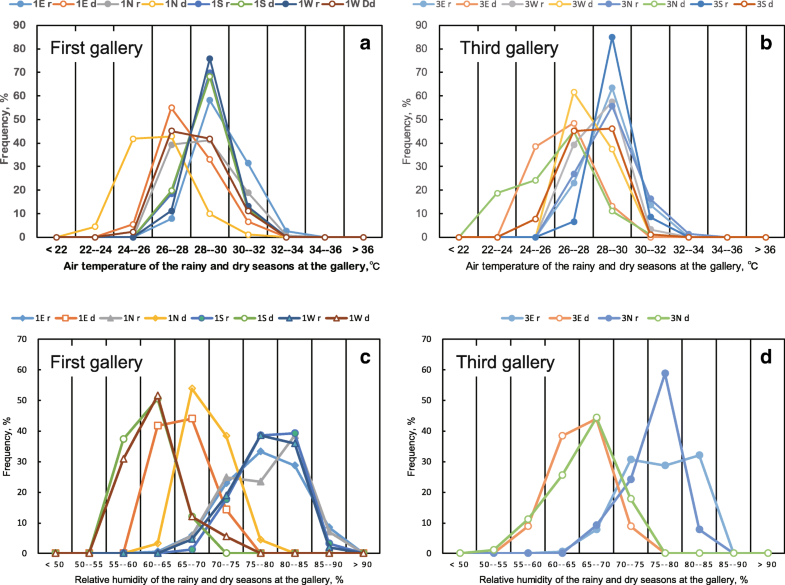 To understand the microclimatic environment of the galleries, daily averages were calculated from the monitoring results of the temperature and relative humidity from 2011 to 2015 (Table 2). However, there are gaps in the data record due to data logger theft and humidity sensor malfunctions. In particular, humidity sensors installed in 3S and 3W (Fig. 2a) experienced a number of defects for a long period; therefore, they did not obtain enough data. The results of the relative humidity in 3S and 3W were therefore excluded from Table 2. Regarding a comparison between the monitoring results and the directions of the galleries, it is found that the annual average temperatures were lowest in 1N (28.7 °C) and ranged from 29.6 to 29.7 °C in the other directions of the first gallery. With respect to the humidity, 1N had a maximum of 73% followed by 1E (70.8%), 1S (70.1%), and 1W (69.4%). The range in the humidity was small in 1N (28%) and was larger in the other galleries (31–36%). The average temperature in the third gallery ranged from 28.6 (3N) to 29.1 °C (3S), a relatively small range. The average humidity was at a minimum of 70.0% in 3E and a maximum of 70.9% in 3N, also showing a small range. The difference between the maximum and minimum relative humidities was small in 3E (27.9%) and 3N (27.1%). These results indicate that the northern gallery (1N) has low temperatures and small changes in humidity throughout the year. In the third gallery, the northern gallery (3N) had low temperatures, but the temperature difference between 3N and the other galleries was small. The humidity differences due to the directions of the galleries were less than 1% in the third gallery. As mentioned above, the hollows develop at the bases of the inner pillars and the depths of the outside hollows are deeper than those of the inside hollows in the first gallery. The hollows in the third gallery are deep for the outside hollows, except in 3S. In addition, the hollow depths are shallow in the northern gallery, and show a difference due to the gallery direction. In previous studies, Takahashi and Matsukura (2006) point out global solar irradiance, as a major factor of directional dependence for depressions that developed on sandstone bridge piers. Paradise (2002) argues the importance of wet-dry changes in rocks from weathering rates of sandstone quarry surfaces in Petra, in addition to temperature changes due to insolation. Several weathering processes are present for sandstone weathering at Angkor (e.g., Uchida et al. 1999; Waragai 2002, 2005a; Archaeological survey of India 2006; Hosono et al. 2006; André et al. 2008, 2011; Siedel et al. 2008, 2010). However, there are very few discussions regarding the directional dependence of these processes (e.g., Waragai 2005b, 2016; Waragai et al. 2006; Hiki and Waragai 2014). This is due to the availability of climate data at the study area. Therefore, from the viewpoint of the microclimatic environment, we consider several reasons for the differences in the hollow depths due to the directions of the hollows and the galleries. The average hollow depth in the first gallery was 34.1 mm deep for the outside hollows, and 12.9 mm deep for the inside hollows (Table 1). In the third gallery, the outside hollows were on average 53.9 mm deep and the inside hollows were on average 46.8 mm deep. Such depth differences between the inside and outside hollows results from changes in the water content related to the occurrence of wet-dry and salt weathering processes. In the first gallery, since the inside of the inner pillars face a closed wall, the pillars are rarely exposed to direct insolation and ventilation (Fig. 2b). While the outsides of the inner pillars experience weather changes due to direct insolation and rainfall, since they face open air. Therefore, the microclimatic environment is considerably different between the inside and outside of the pillars. In particular, the environment brought a difference in the moisture conditions of the hollow surfaces. The water content during the rainy season was approximately 5% on average for the inside hollows and approximately 3% on average for the outside hollows (Fig. 7). Although these measurements were only performed during the rainy season, this indicates that the water content in the inside hollows is higher than that in the outside hollows throughout the year. 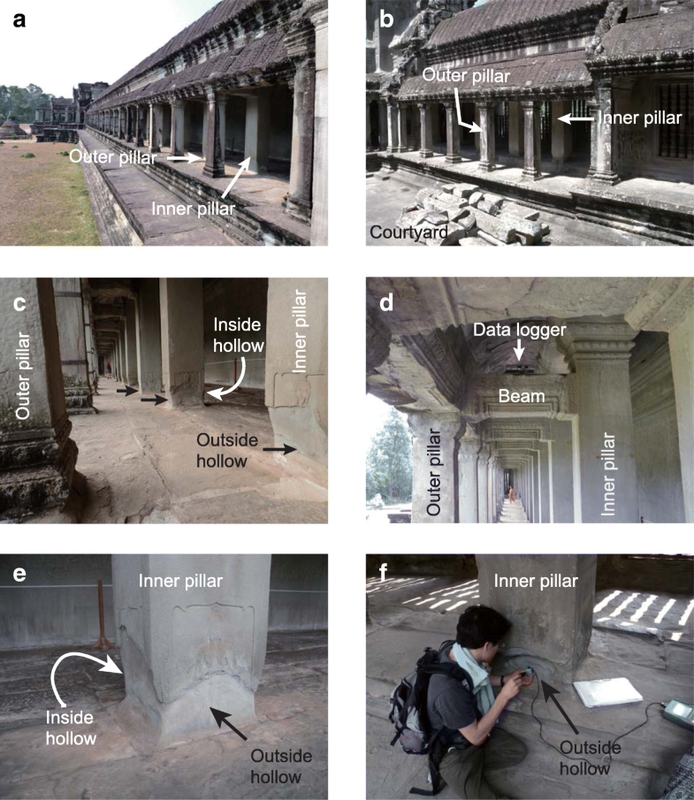 Pillar moisture changes due to rainfall are supposed from experimental results at the Angkor Wat temple (Hiki and Waragai 2014). They monitored water content at the base of the pillar by absorption after watering to the floor of the inner pillar (EN8) in the first gallery in August 2012. Based on the results, the water content of the inside and outside of the pillar increased by 2–3%, approximately 30 min after the watering arrived. Although the water content of the outside returned to its initial value after 60 to 90 min, the water content for the inside did not return to its initial value even after 400 min. This indicates that changes in the water content become large on the outside whenever it rains, but small on the inside of the pillar. The relationship between the water contents and the average hollow depth of the pillar in the gallery is shown in Fig. 8a. The depths in the first gallery tended to be deep for the outside hollows, which indicated low water content. Since the third gallery is a ventilated area, the water content is low in both the inside and outside hollows. The reason that the hollow depths in the third gallery are deeper than those in the first gallery is due to the large changes in the water content. The outsides of the inner pillars in the first and third galleries are easily deteriorated due to the larger changes in the water content based on changes in the weather. According to the results, the hardness of the pillars in the first gallery showed an average of 402 HLD and 334 HLD in the outside and inside hollows, respectively, and a hard in the outside hollow (Fig. 6). 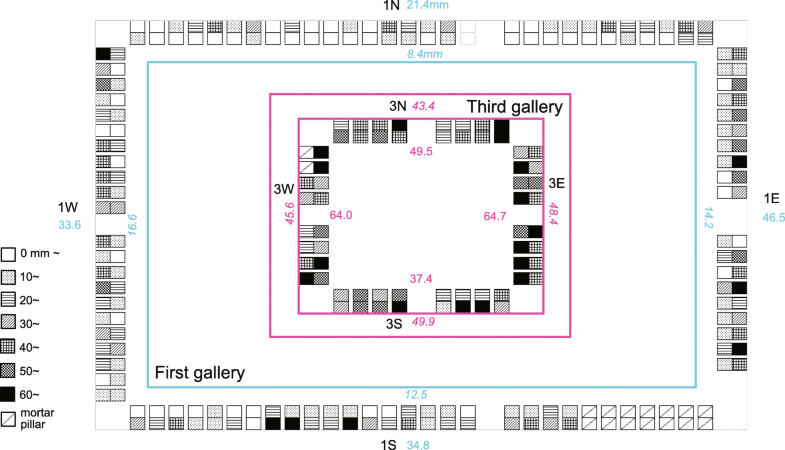 The average hardness in the third gallery is smaller than that in the first gallery, and the difference between the outside hollows (311 HLD) and inside hollows (323 HLD) is small. As shown in Fig. 8b, although the hardness tended to decrease with increasing water content, a hardening of the surfaces in the hollows due to the efflorescence of gypsum (Uchida et al. 1999) might be predominant in the first gallery. As for the reason why the hollow depths are deeper on the outsides, it is likely that the large and frequent moisture changes on the outsides of the pillars cause these surfaces to suffer wetting and desiccation via direct insolation. The moisture conditions of the pillars also differed with the gallery direction. In the first gallery, the average hollow depth varied with the gallery direction, and was deeper in the eastern gallery (the outside hollow is 46.5 mm and the inside hollow is 14.2 mm), followed by the southern (34.8 and 12.5 mm), western (33.6 and 16.6 mm), and northern (21.4 and 8.4 mm) galleries (Fig. 5). Such differences in the hollow depths may be a consequence of the annual and daily wet-dry cycles. 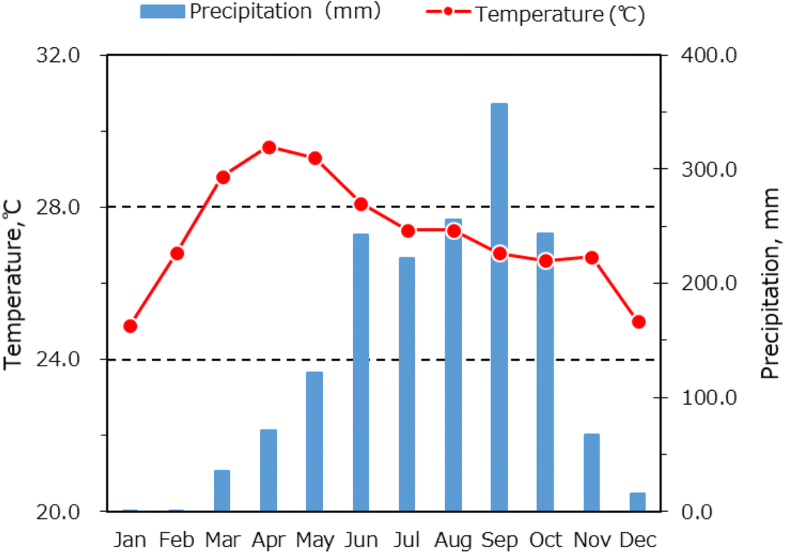 Figure 9 shows the frequencies of the temperature and the relative humidity for each period: from June to October (the peak rainy season), and from December to February (the peak dry season). Seasonal temperature changes are small (Fig. 9a, b), whereas the humidity changes are large (Fig. 9c, d). For instance, the humidity is frequently between 60 and 70% in the dry season (Fig. 9c), whereas it switches to between 80 and 85% in the rainy season, varying by approximately 20% from season to season. The humidity also has daily cycles and is a major factor in sandstone weathering (Paradise 2002). Therefore, an integrated daily range of relative humidity (IDRH), i.e., the difference between the daily maximum and minimum during the rainy and dry seasons, is used to compare with the average depths of the outside hollows (Fig. 10). It means that the IDRH is an index of the intensity of the wet-dry changes in a pillar. A high IDRH index indicates a large difference between the daily maximum and minimum humidities and therefore a high frequency of wet-dry changes in a pillar. 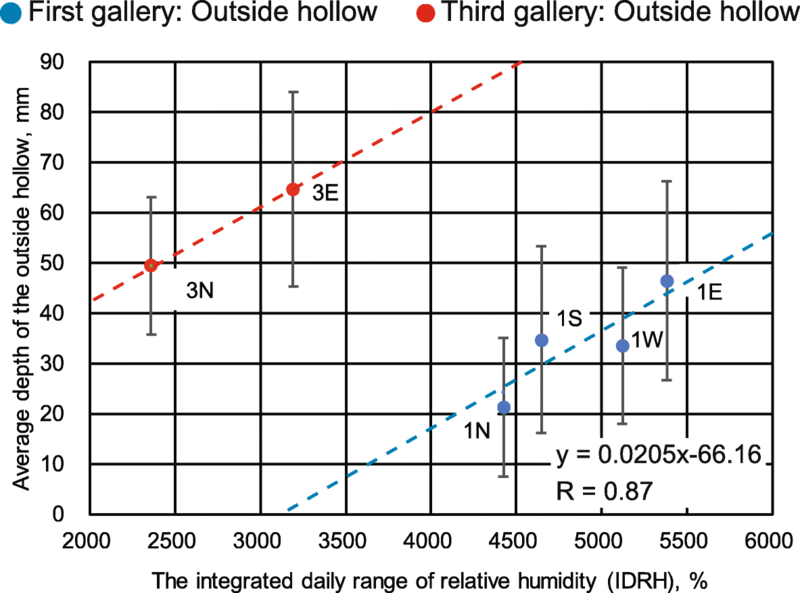 Figure 10 shows that the IDRH is approximately 5400% in the eastern gallery (1E; i.e., the gallery with the maximum hollow depth), while the northern gallery (1N; i.e., the minimum hollow depth) has an IDHR of approximately 4400%. This indicates that the eastern gallery has a higher frequency of diurnal changes and therefore has more occurrences of wet-dry changes compared to the northern gallery. According to Waragai (2007), the surface temperature of the outside pillars reaches approximately 52 °C due to morning sunshine on the eastern side of the first gallery. The maximum surface temperature of the pillars in the western gallery, exposed to the afternoon sun, reaches 47 °C and is higher than that of the northern gallery (approximately 41 °C). Insolation therefore dries the pillar and induces a large change in the pillar moisture. There is also a relationship between the IDRH and the hollow depth in the third gallery. The hollow depths are the same in both the eastern (outside hollows 64.7 mm, inside hollows 48.4 mm) and western (64.0 and 45.6 mm) galleries, whereas the northern (49.5/43.4 mm) and southern (37.4/49.9 mm) galleries are shallow (Fig. 5). As shown in Fig. 10, the IDRH of 3N tended to be low compared to that of 3E in the third gallery. In addition, because the outside of the pillars in the third gallery face an open space (Fig. 2), the wet-dry change occurs more easily on the outside of the eastern, western, and northern galleries, and the insides of the pillars in the southern gallery, all of which are exposed to direct insolation. The rear parts of these galleries, which receive very little insolation, are not exposed to wet-dry repetitions. The hollow depths in the third gallery were deeper than those in the first gallery, although the IDRH is lower (Fig. 10). This is possibly due to a previous period of vegetation cover. The first gallery may have been covered with dense tropical vegetation from the end of the Khmer Empire until the temple’s rediscovery (1431–1860 CE). There has been a sustained, ventilated environment in the third gallery since the construction of the temple. Therefore, in the first gallery, which is located at a lower level, the weathering of the sandstone pillars may have been delayed during periods of high humidity. According to André et al. (2008, 2012), the weathering rate of the sandstone blocks at the Ta Keo temple (3.5 km from the Angkor Wat temple) increased due to the enhancement of sandstone desiccation via tree cutting in the 1920s. Cutting trees causing the root wedging, as a part of the conservation effort, induces ironically sandstone desiccation, increasing the impact of wet-dry weathering. Therefore, it is possible that the sandstone block deteriorates faster at present than it did in the past. The hollow depths vary with gallery direction because the northern side of the first gallery maintains a high humidity condition with a small humidity range, which is contrary to the conditions in the other galleries. The intensity of the wet-dry changes in the northern gallery (1N) is low compared to those of the other galleries; accordingly, there is very little sandstone pillar weathering in the northern gallery. 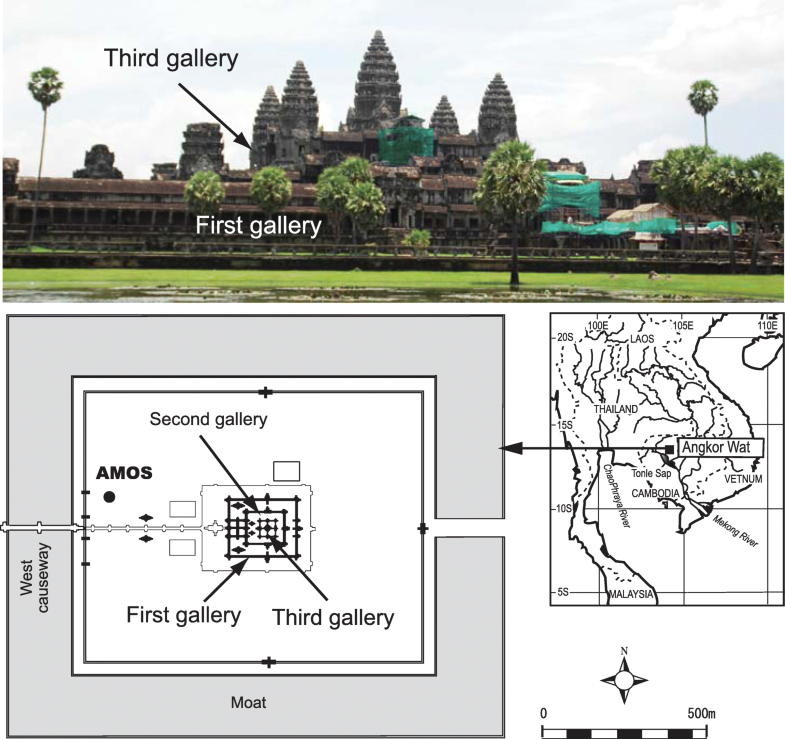 In this study, we examined the determinants of the hollow depth differences based on 5-year temperature and humidity observations, which sufficiently represent the environmental conditions in the galleries at the Angkor Wat temple. The results indicate that the outside hollows of the inner pillars are deeper than the inside hollows in the first gallery. In the third gallery, the outside hollows are also deeper, except the 3S hollow. This is due to the large and frequent moisture changes on the outsides of the pillars caused by frequent precipitation and desiccation via direct insolation. The hollow depths are deep in the eastern gallery and shallow in the northern gallery and vary with the gallery direction. A possible reason for this directional dependence in the hollow depth can be attributed to the high frequency of humidity changes on the eastern side of the first gallery (1E). The intensity of the changes in the wet-dry cycle in the northern gallery (1N) is low compared those in the other galleries, i.e., in the northern gallery, the sandstone pillar weathering is negligible. Further investigations, including monitoring of the water content and surface temperature of the sandstone pillars, should be performed to understand the directional dependence of the weathering processes in detail. The authors wish to thank APSARA (the Authority for the Protection and Management of Angkor and the Region of Siem Reap) for the permission to conduct this research. The authors also thank Professor Y. Ishizawa (Sophia Univ.) and Mr. S. Miwa (Sophia Univ.) for their cooperation. We thank Dr. A. Hada (Ryukyu Univ. ), Dr. T. Kajiyama (Nihon Univ. ), and Mr. T. Maeda (Nihon Univ.) for their assistance in our field experiments. This work was supported by JSPS KAKENHI Grant Number 22401005 and 26300008, in addition to the College of Humanities and Sciences of Nihon University. TW proposed the topic, conceived, and designed the study. TW and YH carried out the field survey, analyzed the data, and shared their interpretation. YH collaborated with the corresponding author in the construction of manuscript. All authors read and approved the final manuscript.